Gila (Pronounced "hee-la") Bend, near a sharp bend in the Gila River, is on a desert plain in Southwestern Maricopa County. It is located near a prehistoric Hohokam Indian Village visited by Father Eusebio Francisco Kino in 1699. Kino found the fertile banks of the Gila River had been abandoned by an early Indian tribe called the Opas, who had established a rancheria and raised two grain crops annually, irrigating from the Gila River. Tha same rancheria was visited by Spanish Captain Juan Bautista Anza, commander of the Presidio at Tubac, and founder of the city of San Francisco, and Father Francisco Tomas Garces in 1774. They named it Pueblo de los Santos Apostales San Simon y Judas. Remnants of early civilations that inhabited this basin are still in evidence. Some relics are on display in the town museum. Gila Bend is also in the process of developing the Gatlin Archeological site, north of town. In 1858, Gila Bend became a stop along the overland stage route. During the 19th century, the Gila Trail became the major throughfare in Arizona. Many famous individuals passed through town such as Kit Carson, General Stephen W. Kearny and Captain Philip St. George Cooke. However, agriculture was always the town's mainstay. Cotton, alfalfa and grain are the most common crops grown. The town was incorporated in 1962. Today, both agriculture and traveling tourists make Gila Bend a busy town. 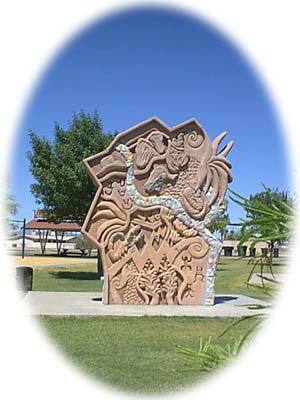 Many travelers heading to Rocky Point or San Diego from Phoenix use Gila Bend as the place to take a breather. Painted Rock Petroglyph Site, just south of Gila Bend and approximately 90 miles southwest of Phoenix, Arizona, provides visitors the opportunity to view an ancient archaeological site containing hundreds of symbolic and artistic rock etchings, or "petroglyphs,"